Manitowoc, WI- Dramm is pleased to offer the first in a line of automation enhancements for the Hydra Spraytrax sprayer platform. The Dramm Electricwind Kit winds long lengths of hose with the push of a button. The new kit eliminates hand winding of long hoses. The Electricwind Kit is cantilevered off the back of the Spraytrax frame, keeping a low center of gravity. The Electricwind is variable speed for safety. To prevent hazards, the Electricwind operates only when the button is depressed. 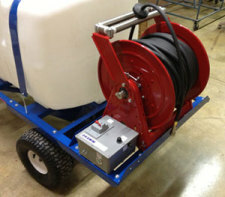 Versions are available for both the electric and gasoline Hydra Spraytrax. The gasoline version includes an electric start upgrade on the 5.5HP Honda motor. For more information, please contact us at the numbers to the left or via email.